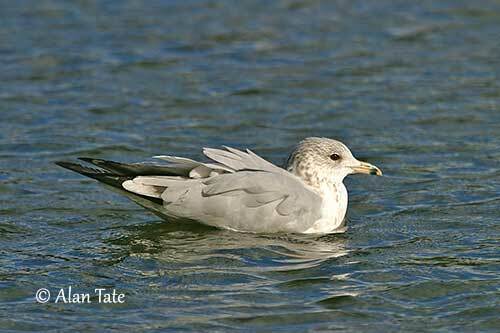 The Ring-billed Gull is common and widespread throughout North America, and occurs both in coastal regions and inland areas. Very familiar and adaptable, but opportunistic too, it often steals food left unattended by people, especially on highly crowed beaches. For this reason, it is often considered a pest. Nesting colonies and winter feeding sites may contain tens of thousands. It returns to breed at its natal colony, and numerous birds return to the same wintering areas each winter. 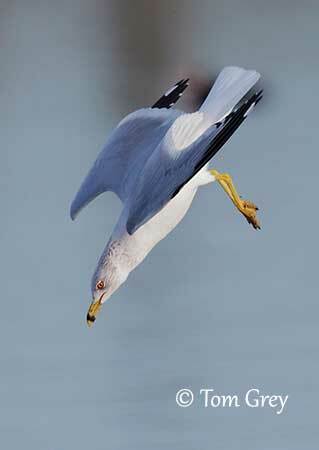 The Ring-billed Gull is migratory. It breeds in Canada and N United States, and moves S after the breeding season, reaching the Gulf of Mexico, Atlantic and Pacific coasts and Great Lakes. This species has large increasing population and is not currently threatened. 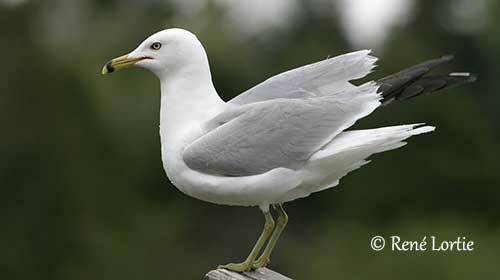 The Ring-billed Gull in breeding plumage has white head, neck and underparts. The upperparts are pale grey. On the upperwing, the wingtip is black with white mirrors on the two outermost primaries, and we can see a white trailing edge. Rump and tail are white. The bill is yellow with black subterminal ring. The eyes are pale yellow, surrounded by red eyering. Legs and feet are greenish-yellow. The non-breeding adult has streaked and mottled dusky head and hindneck. The eyering is black. 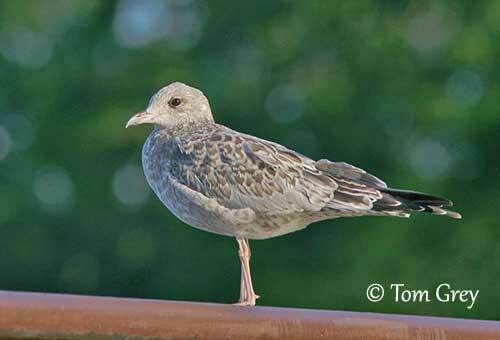 During the first two years, the young gull has mottled brown and grey plumage with pink bill and legs and dark brown eyes. It obtains the adult plumage at three years old. The first winter has flesh-coloured bill with black tip, flesh-pink legs and feet and brown eyes. Head, neck and underparts are white with brown streaking and mottling. The back is pale grey. The upperwing is grey-brown with dark leading edge to outer wing. The secondaries have a blackish bar. Greater coverts and inner primaries are pale grey. Rump and tail are whitish with black subterminal band on the tail. The second winter is similar to adult, but it has dull yellowish bill with black band. The wingtips are black but the white mirrors are reduced or absent. Tail and secondaries show some trace of blackish bar. 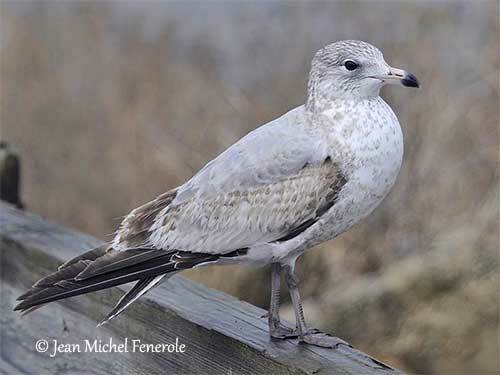 The Ring-billed Gull breeds in NW USA (N California and E Washington), in S Canada (interior British Columbia), and Great Lakes to the Maritime Provinces. It winters in the southern regions of the breeding range, S to Gulf coast, Central America and Greater Antilles. The range is increasing into the Lesser Antilles. 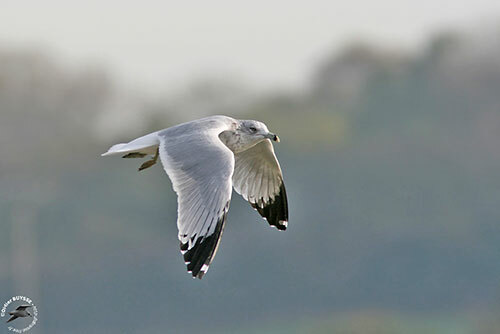 The Ring-billed Gull breeds in colonies on low islands in freshwater lakes, and in wet meadows. Outside breeding season, it can be seen along coasts, piers, dumps, harbors and estuaries. The species is common around cities, docks and farm fields, and often roosts on lakes and reservoirs. It feeds primarily on land, and favours mainly fresh water. It is rarely seen offshore. 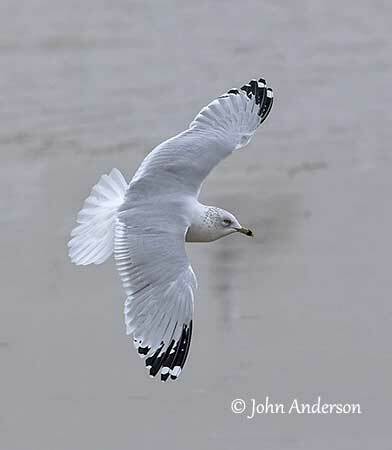 The Ring-billed Gull is usually silent away from the breeding colonies. It may sometimes give a mellow “kowk”. It also produces a yelping “ky-ow”, a mewing “kee-a kee-a kee-a kee-a kee-a” and a thin, whining “wheeah”. 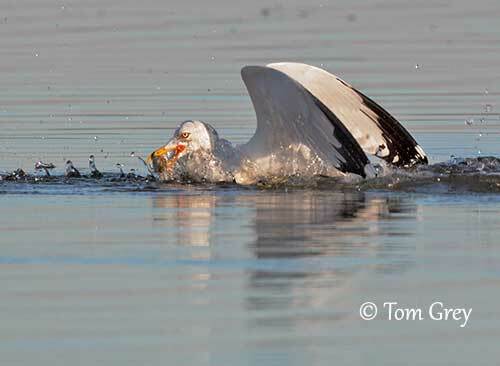 The long call is higher, harsher and less nasal than in Mew Gull. This call is given with the head held back. 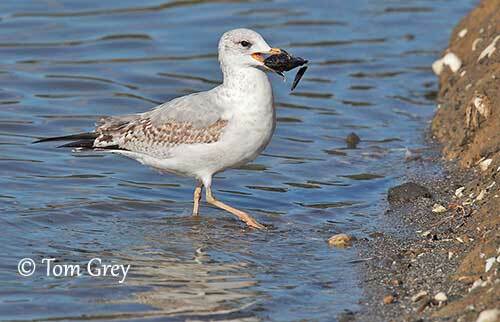 The Ring-billed Gull is omnivorous and opportunistic, and often scavenges food provided by human activities. Its diet varies according to the location and the season. It feeds mainly on insects, fish, earthworms, rodents, refuse and grain. Grubs and earthworms are taken in plowed fields. It forages by walking, wading and swimming, and even while flying. It is often seen scavenging at rubbish dumps and takes food scrapes if available. It also steals food from other birds. 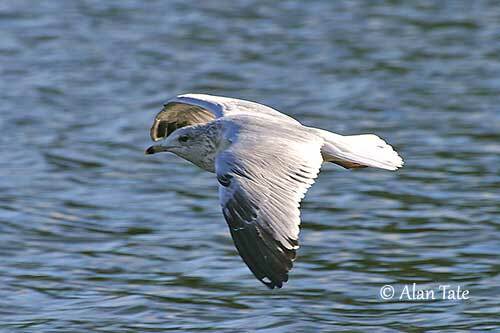 The Ring-billed Gull is a colonial nester and often forms mixed-species colonies with the Herring Gull and the California Gull. 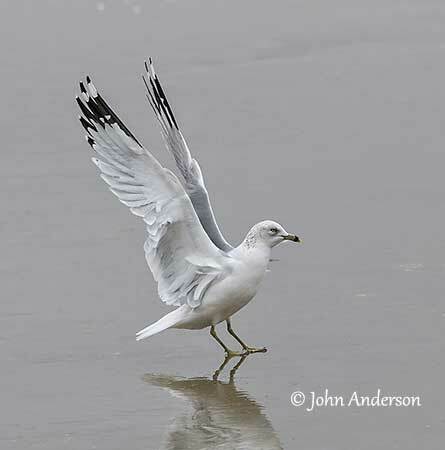 Some courtship displays are reported during which two gulls stretch upright while alternately facing towards and away from each other. Courtship feeding by male to female is commonly observed. Pairs form soon after their arrival on the breeding grounds, or just after. They are often monogamous, but occasionally, two females mate with a polygynous male, especially in large colonies. 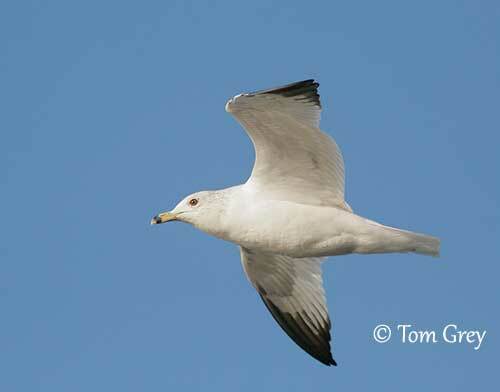 The Ring-billed Gull is migratory and leaves the breeding colonies in July/August. Some juveniles may leave in late June. Vagrants in the Americas have reached Galapagos Islands, Columbia, Venezuela and Brazil. The species is frequently recorded from the W Palearctic (British Islands, Iceland, France, Iberian Peninsula and elsewhere in Europe). There are some observations from Africa (Morocco, Senegal and The Gambia) and Canary Islands and Madeira (rarely). 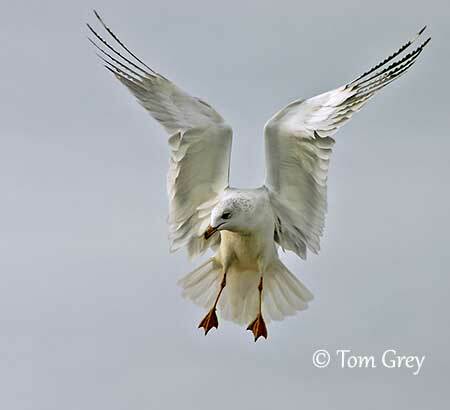 The Ring-billed Gull soars on thermals. It has strong, direct flight with deep, rapid wingbeats. The breeding season takes place between May and August, with the laying in late April/May, or later depending on snow cover in the northern part of the breeding range. The Ring-billed Gull nests in large colonies. The nest is on the ground, often beside a rock or vegetation, within one metre from the neighbour. It is usually near water among sparse vegetation. Both mates build a shallow cup with grasses, twigs, leaves, lichens and mosses. The same nest-site is often reused year after year. The female lays 2-4 eggs (sometimes more, but clutches of more than 4 eggs are laid by two or more females). The eggs are pale and heavily spotted with dark brown. Both adults incubate during 23-28 days. The chicks are brooded and fed by their parents. They leave the nest a few days after hatching, and remain in the vicinity of the nest. Small crèches are sometimes formed in some colonies. The young birds fledge about 37 days after hatching. They are independent 5-10 days later. 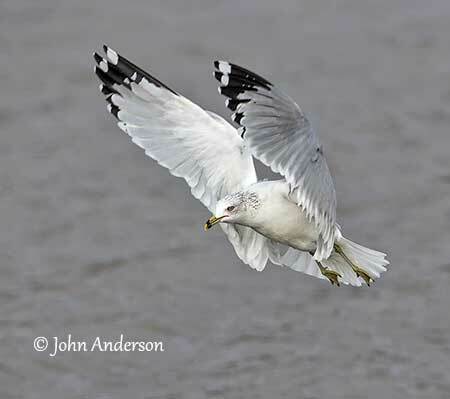 The Ring-billed Gull is now an abundant species, following a serious decline during late 19th century, due to human persecution. It has benefitted from food provided by farming practices and rubbish dumps. The global population is estimated at 1,500,000/2,000,000 pairs, and is probably still increasing. 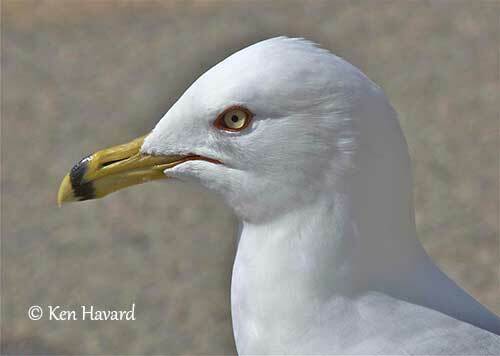 The Ring-billed Gull is currently evaluated as Least Concern.